Nowadays, it’s arguably more difficult to stay healthy. Since technology has made it easier for humans to navigate this world without so much as lifting a finger, there are fewer reasons to move about. The world is not one step closer into becoming that in the film of Disney Pixar’s “Wall-E,” wherein human are just sitting around, have become immobile and obese. While it’s a fictional narrative, it’s also a warning that maybe humans are relying too much on technology to live their lives for them, which can ultimately be a dangerous precedent. People still need to move about in order to be healthy. Recently, however, there’s a unique alternative that’s become quite an efficient mode of transportation: riding an e-bike. Instead of sitting in cars, waiting for the traffic to disperse, you can peddle your way to your destination and live a healthier lifestyle that’s still, technically, reliant on technology. If you’re not convinced, maybe this list of health benefits will. Perhaps the most common health benefit of riding an e-bike is that you get to move. When you get to move, you’re able to prove to yourself that your body is working fine. And when you know your body is working fine, you’ll also be able to exercise more and do stuff that can keep you healthy and energize. Want to run in the morning? Want to hike to the mountains? Why not? The possibilities are endless when you’re able to move about. Read Also Why Choose an Electric Bike? Riding an e-bike also keeps your body stimulated. This is crucial as your body needs to be stimulated as much as it can. The only time when it shouldn’t be is when you’re sleeping and relaxing. Other than that, stimulation is key to avoid developing a lazy lifestyle and to keep your systems in check while you accomplish other tasks for the day. When the screws inside your body are kept turning, you’re more able to focus on work or studies more, concentrate on whatever it is that you’re doing, and keeps you mentally-aware of your surroundings at the same time. You’ll need to pump your adrenaline every once and a while to promote better blood flow. a good heartbeat rate, and a simulated body. Fortunately, cycling with an e-bike pumps your adrenaline is just the right amount that you’re not overly-worked and exhausted at the end of the today. With that, you’re more able to move about, stay physically and mentally stimulated, and the blood is pumping in all the right vessels and tubes. You’re essentially more energized when you’re rightly pumped, not too much and definitely not too little. Too much weight can lead to obesity, which is a health defect in of itself. You can easily avoid this by choosing to ride an e-bike going to work or school instead of driving a car or riding the bus. The more you peddle, the more weight you shed, and after every day of cycling to and from work or school, you’re becoming trimmer and fitter. And with that, you’re also more able to do all sorts of physical activities, which in turn, will also aid in substantial weight loss. Want to strengthen your body? Forget lifting weights, just replace your car with an e-bike for when you go to work or school. This exercise, a vital one at that, keeps you toned, pumps up your adrenaline, and defines your muscles. What’s even better is after every ride, you’re not only in time for work or for class, but you’re less exhausted as well. This means you’ll still be able to accomplish your work or finish classes, and all sorts of other activities that can benefit your new healthy lifestyle. What will you need the most to keep your respiratory system on track? A lot of fresh air. And you can only get that when you ride an e-bike. Firstly, the open vehicle leaves you more entwined with nature, as well as the sweet-smelling oxygen they emanate. However, this doesn’t necessarily prevent you from inhaling the air pollution from the city, especially with cars. This is where the beauty of e-bikes come in. This nifty mode of transportation is actually sustainable and environmentally-friendly as it doesn’t have that big of a carbon footprint. 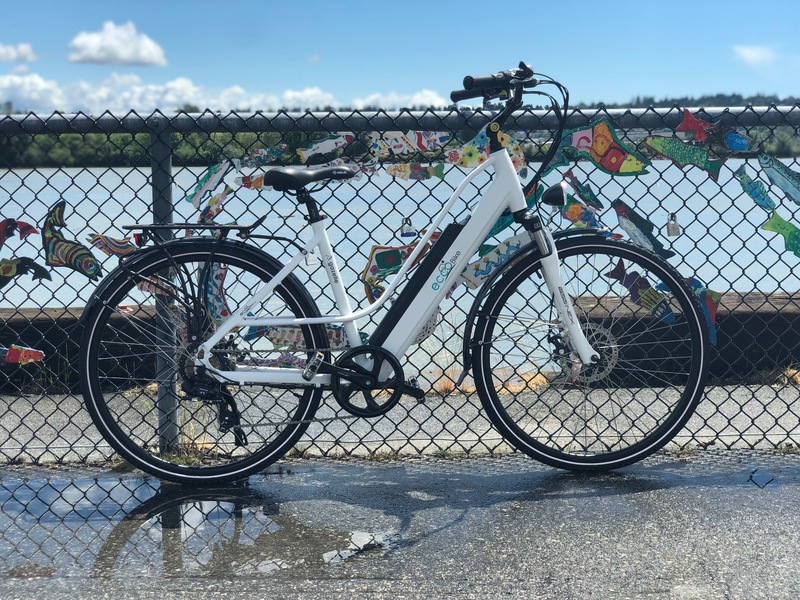 Furthermore, an e-bike allows you to go places with less smoke so you’ll have a more breathable route to work or school. This cannot be stressed enough! Sure, exercising is great for a healthy lifestyle, but so is having a well-feeling body. If your fitness regime keeps you exhausted after every session, then you won’t get to reap its many benefits. When you’re too exhausted, you’ll have less time to go out with friends and family. You’re more likely to spend more time sleeping in or worse, become lazy. Imagine not getting into the heat of the traffic, reaching your workplace or school on time, and getting feel fresh air every morning. These can keep you at peace, right? And these are more possible to attain when you’re riding an e-bike instead of a car. Arguably, you’ll be more at pease cycling your way through the city, into different areas with less pollution, than going about in a car that can get yous tuck in traffic and late for work. In fact, the latter can add more stress to you than doing the opposite. Everyone needs a pastime that can help them forget about their troubles, and riding an e-bike is a great one. That ride you take every morning and every evening can be a time of reflection and relaxation. You can choose to forget about your problems or think up solutions on how to fixe them during that length of time that you’re peddling your way onto work or school. It’s an effective method into compartmentalizing your thoughts and not letting them ruin your work day or class. Anything easy to use is good for one’s health, both physically and mentally. For the former, you can do the action more and more until you have a stronger and fitter body and better systems. While for the latter, doing something easy tells you that you’re capable of accomplishing anything you want, particularly solving your own problems and relaxing. And nothing is as easy as rising an e-bike. Since they’re electronic, you’re less inclined (but you still have to put in the effort) to peddle as much as when you ride traditional bikes. “An e-bike ride a day keeps the doctor away.” Remember this the next time you’re thinking of changing things up on how you travel from place to place.